All the messages exchanged between individuals. All the messages related to vehicular traffic, including trucks, taxis and emergency vehicles. 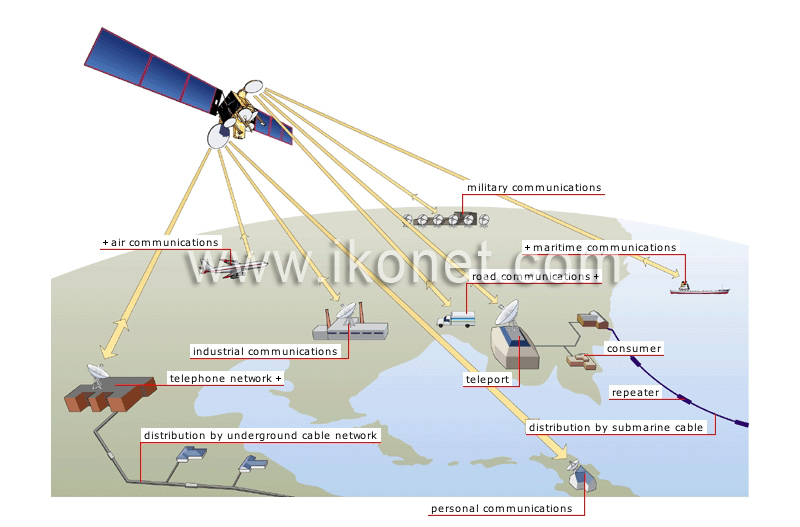 All the installations allowing the exchange of data or voice messages, sounds or images between two or more customers. Installation with equipment allowing it to offer customers access to satellite telecommunications services. All the messages used to help ships and submarines navigate and to control maritime traffic. All the messages related to the armed forces and battleground operations. All the messages used to help aircraft navigate and to control air traffic. All the messages exchanged by companies involved in the production of goods and services. Device running the length of a cable that receives, amplifies and resends signals to transmit them over long distances. Signals can be relayed through a network of underwater cables. Signals can be relayed through a network of underground cables.